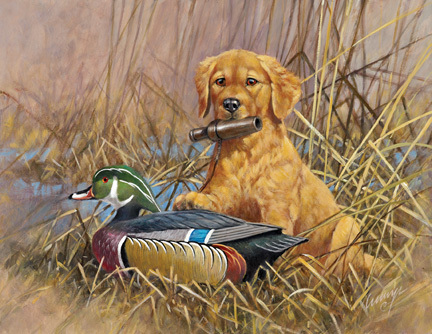 The Retriever Puppy Series/Print IV - "The Golden Retriever Puppy"
This is the twenty-third stamp to be issued by New Jersey and the fourth in the Retriever Puppy Series and features a Golden Retriever puppy. 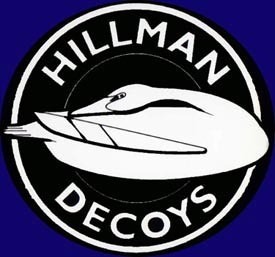 Painted by award winning artist Roger Cruwys, the stamp features a wood duck decoy carved by Jode Hillman. The New Jersey Division of Fish and Game selected one of my Drake Wood Ducks to be featured on the 2006 New Jersey Waterfowl stamp and print series. I was honored to be selected and I am proud to be part of such an important conservation effort. The 2006 NJ duck stamp is complete and can be seen above. I think it is nicely done and the proceeds will greatly benefit waterfowl here in NJ. The stamp and prints are available from the NJ Division of Fish and Game by visiting their website or by clicking on the PDF order form available below. Artist information is also available by clicking the following link. http://www.state.nj.us/dep/fgw/ Fish and Game home page.